Fully furnished Beach Front 1 bedroom home located in the much sought after Blue Bayou area of Utila. Our Beach House has a great island feel with a living area, fully equipped kitchen, 1 bedroom and 1 bath with hot water shower. There is a queen bed, futon and open shelving for clothing. We have town power and water, ceiling fans, air conditioning & available internet (broadband card). The house has a nice covered front porch with wooden swing and hammock. A great place to have your coffee and watch the sun rise, boats, snorkelers and eagle rays passing by. There is also a large deck in front of the Beach House, extending over the water. A raised Champa (an open sided, roofed area) which is a great place to relax, watch all the activities going on in the bay and catch the beautiful Utila trade winds. The Beach House is nestled in between the Caribbean Sea and the Lower Lagoon which provides access to the pristine beaches and reefs of the northern shores of Utila. The reef along Blue Bayou is vivacious and healthy with many reef fish, eagle rays, moray eels, lovely Staghorn Coral, Brain Coral and ecosystems to explore. The snorkeling and shore diving is just fantastic here. Always, when visiting any ocean destination, be sure to bring sun screen, your snorkel, mask, water booties and fins for exploring all the sea life that is right out our front door. Check with the dive shops for renting tanks as there is a dive site just yards from the deck. Be sure to bring bug spray. As a rule we always have a nice breeze blowing so sand fleas should not be a problem, but if the breeze dies down we have found that baby oil works well, along with bug coils which are available in any store on the island. Utila is just a beautiful little island with friendly people. A must see for divers and non-divers alike. Deanna's family is 4 generations on Utila. She and Ed spend about 3 months out of the year here in their 2nd home, also located in the Blue Bayou area. They are making plans to live full time on the island because of its beauty, hospitality and long family history. 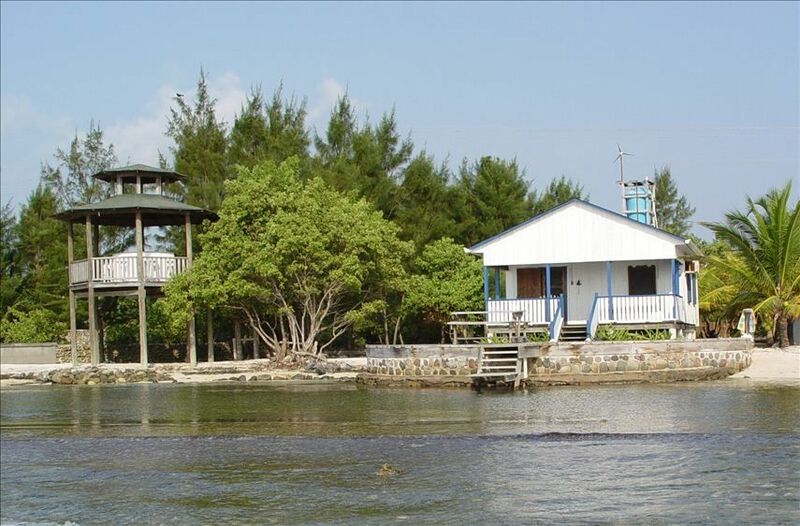 The Beach House in Blue Bayou is close enough to town to shop, dine and take in the island's culture, yet situated in one of the most private and quietest areas on the island. Truly, the diving and snorkeling right outside the front door is unrivaled. The warm Caribbean Sea is right out your front door, literally. If you dive, snorkel or just love playing in the ocean, this property is for you. The house has a/c in the bedroom. For internet service we us a broadband stick which requires a USB slot (we're working on wifi for the house). Kitchen, Stove, Coffee pots, Cooking Utensils and appliances are provided. Kayaks are available to rent. See Jaylin for details! Bicycles are available to rent. See Jaylin for details! masks and snorkels are in the house and available for our guests to use. Town is within walking distance but we have a 4 wheeler and scooter that are available to rent as a more convenient way to get around or for guests who would like to explore the island. Jaylin has details on rates and availability. This cabin is small, but comfortable for 2 people that aren't looking for a luxury vacation. The location is perfect, the snorkeling right off the beach is wonderful. It is just a short ways to town & lots of good restaurants. Be aware that the pictures showing the deck going straight into the water is no longer the case. There is now a rocky area built up between the deck & the water & it is best to walk down the beach 100 feet or so to enter the water. Javier, the maintenance man is almost always around & can take care of any issues that come up. He is a wonderful person & it was good to get to know him. The walk into town was too far for us & the tuk-tuks were inconvenient so we rented a golf cart from Javier's cousin Angel for the entire time. I recommend doing that for the freedom it gives. Angels golf carts aren't new, but work fine & are half the price of renting one in town. All in all this is a great place for the right person or couple. We enjoyed our time at the little beach cabin in Utila. It's a little rustic but perfect for us. We loved the snorkeling right out the door! Perfect views off the porch, it was quiet and relaxing! We didn't cook much, too many restaurants to try out. Made a little toast in the morning and then tried out one of the great restaurants in the afternoon. The TV didn't work, but didn't need it with the view outside. The WiFi worked well though. We would definately come back and stay here again! Our recent stay at the Blue Bayou Beach house was perfect. if you're looking for amenities that you would find at a beach resort, this house is not for you, however it was perfect for my wife and I. Mike, the property manager takes care of anything you made need. He comes by everyday and is always a pleasure to talk to. You will not find a better view of the sunrise than from the hammock on the porch of Blue Bayou Beach House. We spent a lot of time on the porch. The neighborhood is quiet and it's only a 10-15 minute walk to town. There is great snorkeling right off the dock. I agree that the house could use a little TLC (updating), but it does have everything you need. It's the perfect place for two people to get away and truly have some down time! The island was great and I hope to go visit again soon! We hope that our future potential guests disregard these last 2 reviews. We started to write a long rebuttal to these to set the facts straight but decided that it was not worthy of a long drawn out explanation, as our previous reviews better represent the Beach House and Utila. That being said, we can not stress enough that Utila is a very rustic island and is a place set back in time. This is part of the beauty and draw to the island. It is not a vacation destination that will cater to the needs of travelers who are looking for the amenities of resorts and other fashionable accommodations. We go out of our way to answer any questions that ours guests may have about Utila, to help them with travel arrangements and to make their stay as comfortable as possible. It is upsetting to us that guests that should not have chosen to vacation on Utila to begin with, feel compelled to write reviews such as these, only because of their skewed expectations. My husband and I have been using VRBO for18 years and have never written a negative review. Today is a first. Right off the bat we were not happy about the fact the main three reasons we chose this house were not as expected. 1 the beautiful water is not so beautiful, the afternoon tide brings is lots of garbage and the beautiful sand is covered with it. Most places do raking but none had been done there for some time so lots of garbage on the beach. 2. washing machine was broke. We came from Alaska with back packs, Honduras is hot and humid so we brought few clothes expecting to wash them often and had to pay in town 10.00 a load which is not that bad but an unexpected expense. 3. I specifically talked to the owner about us having AC. We live in a COLD climate and the extremes are hard on us. The house has AC but not really. The windows are not windows but shutters which don't seal and the wind comes in making the AC work overtime to cool things down, you are given limited amount of electricity- AC uses lots so you basically can't really run it much anyway. On top of these things there was nothing to greet you, no basic amenities... no dish soap, no hand soap, there was one garbage bag and one roll of TP. On our arrival after doing a big shopping at the owners suggestion, the refrigerator had not been turned on so it was actually hot inside and there was no ice, it took a full day for the it to cool off enough to keep food cold. The propane bottle was extremely rusted and kept in the house next the stove-slightly unnerving. The shower head has electricity wired in to it for a heating coil-scary. The TV was broke as were the chairs in the Champa.The floor in the kitchen was sticky, the entire house needs a good scrubbing. I complained but nothing was done, we left a week early and I requested a refund or at least our security deposit back and have received no response as of now. The only reason I am giving this home a two star rating is that the dock is great as is the view! Aside from all this we had a good time on Utila, we kayaked the mangroves to the other side of the island and had some great snorkeling. My wife and I recently stayed at the Blue Bayou Beach House in Utila for two weeks. The house needs a bit of TLC, which Mike, the property manager, readily provides. He visits every day to pump the water in the cistern and is on call at all time to answer any questions about the property and the island. He also made sure our stay was as comfortable as possible, kept the property well maintained and fixed all that needed it, like the hammock and swing in the porch, both facing the bay. Those two items are the perfect required amenities to truly appreciate and understand the “Art of Doing Nothing”. Thank You, Mike! Your work ethics, personality and special care are great assets to this beach house!! The island is small, so you can Tuk-Tuk your way around (Osman Taxi ph.9710-6638, Tuk-tuk #7) We paid forty Lempiras per person, per trip to the center of town. Both US dollars and Lempiras are accepted on the island ($21.50/$22.00 Lempiras to $1.00) but I preferred paying with Lempiras. Alcohol is not that expensive compare to New York City prices (shop around). As for wine, drink it at your own risks. Cigarettes are $2.50 per pack. Be careful of the “traveler’s diarrhea”: Any medication to protect you from it, bring it! We enjoyed eating breakfast at “Munchies” and lunch at Laurent’s Creperie (one of the few Frenchmen on the island). If you need to travel from Roatan to Utila, we highly recommend you to fly (Angelo, “Island Air” ph.504-9558-8685). The afternoon ferry we took from Utila to la Ceiba was a metal box roller coaster ride from hell for the longest one-hour of our lives. And, I kid you not: The Red Cross waits for you and the other survivors in La Ceiba! We truly enjoyed those two weeks on the island and hope to do it again very soon. From right out your own front door, there is birdwatching, eagle ray watching & lots of aquatic life to take in. Only a short walk to town, where there are excellent restaurants and bars. There are many grocery markets, banking, a public beach and night life for the younger crowd. Take a 10 minute boat ride to spend a day on your own private cay, swimming, snorkeling and picnicking. A kayak trip to the north shore with our complementary kayaks is a must!